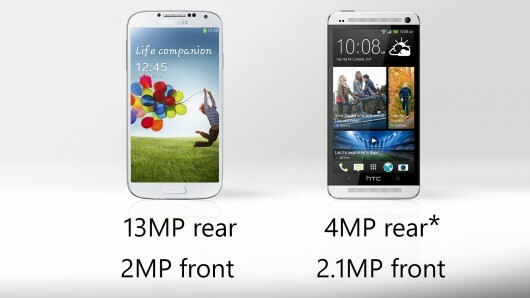 In terms of smartphone quality, the difference between HTC and Samsung is minor. You could even argue that HTC has shown better instincts for design, user-friendliness, and originality. In terms of sales, though, Samsung left HTC in the dust long ago. HTC wants to bring itself back to relevance with its new flagship, the One, but with Samsung’s new Galaxy S4 on its way, does it stand a chance? Let’s see how the two phones’ specs and features compare. 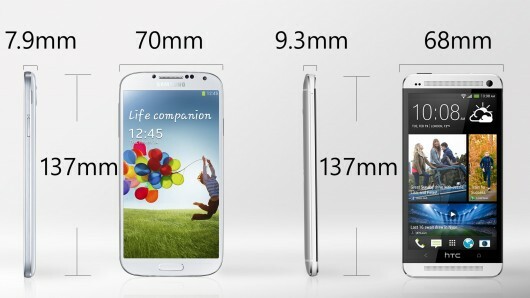 The Galaxy S4 and One are roughly the same height. The One, though, is 2 mm narrower and about 18 percent thicker. 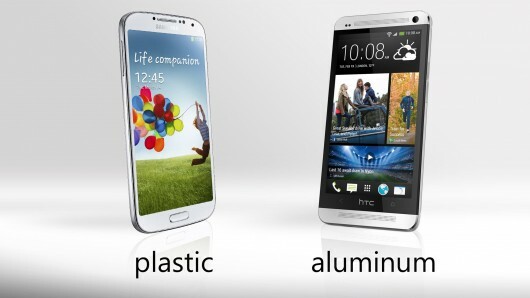 While the Galaxy S4 is made of plastic, the anodized aluminum One may set a new benchmark for smartphone design. HTC accomplished something that’s increasingly difficult: making a smartphone that’s a) stunning and b) not quite like anything before it. With that said, many customers prefer plastic to metal in a phone, so you might want to experiment on your own to find your preference. Plastic does have one distinct advantage: it’s lighter than aluminum. 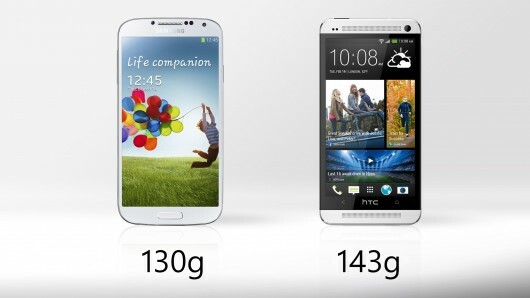 The Galaxy S4 is over 9 percent lighter than the One. Both phones have absurdly-sharp 1080p displays. The Galaxy S4’s screen is a bit larger, but both offer plenty of real estate. The Galaxy S4's display also uses Super AMOLED technology, while the One sports a Super LCD 3 screen. Expect some hyper-saturated colors in the S4. 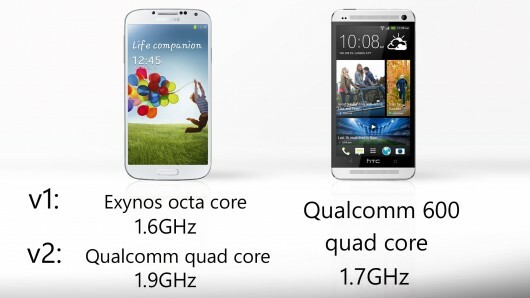 Both versions of the Galaxy S4 should be faster than the One. But as high-end smartphone engines have outpaced the performance requirements of most apps, right now the difference may not show anywhere but in benchmarks. Both handsets are even, with 2 GB of random-access memory (RAM). The base model of the One doubles the internal flash memory of the base Galaxy S4. But Samsung’s handset makes up for it with an expandable microSD card slot. If your local carrier supports LTE, both phones should be able to take advantage of the speedy network. The Galaxy S4’s battery holds more juice. Capacity isn’t a definitive measurement of actual battery life, but it doesn’t hurt the S4’s chances. On paper, this looks like utter dominance for the Galaxy S4. But the notion that megapixel count is an absolute and direct measurement of camera quality is misguided. HTC’s One may demonstrate this better than any other smartphone. 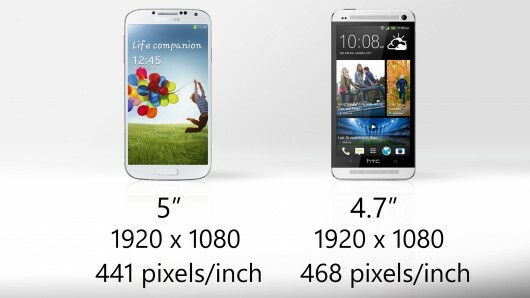 The company put less pixels in the phone's sensors, but the pixels are bigger (HTC calls them “Ultrapixels”). The One also has f2.0 aperture and a 1/3-inch backlit-CMOS sensor, which HTC says will mean better performance in low light. The bottom line: there's no single spec that can accurately compare their cameras. We'll look forward to some lengthy hands-on time, but – in the meantime – we expect both to have good to great image quality. In terms of core operating system, the Galaxy S4 is a full version of Android ahead of the One. 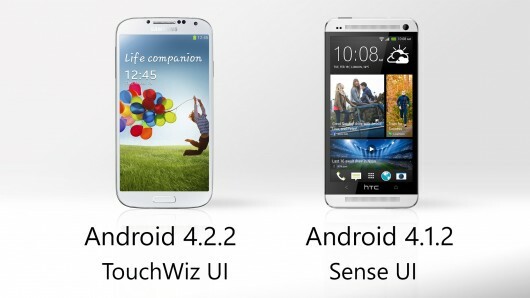 Much more obvious, though, are the custom manufacturer UIs sitting on top of Android. Samsung is pushing its TouchWiz as hard as it can, trying to distance itself from Google’s underlying OS. This means a ton of “innovative new features” that are almost overwhelming to recap. Some of the most notable are Air Hover (preview select tasks by hovering your finger over the display), Dual Camera (combine front-facing and rear-facing stills or video), and Smart Scroll (scroll through emails and web pages via facial recognition). They might be more gimmicky than revolutionary, but you have to hand it to Samsung for trying new ideas. HTC’s new Sense 5, meanwhile, scales itself back a bit. While it previously succumbed to feature creep (which Samsung may now be stepping into), the One’s version of Sense simplifies things a bit. One of Sense’s more memorable features is Blinkfeed, which puts a Flipboard-like news hub on your homescreen. In addition to the familiar grid of app icons, your phone greets you with a tiled view of social and news feeds. Sometimes, in these comparisons, it’s clear which device is better. Failing that, you might still be able to easily differentiate the phones’ target audiences: this one is better for X customers, that one is better for Y customers. That isn’t the case here, as both sit at the top of the heap. 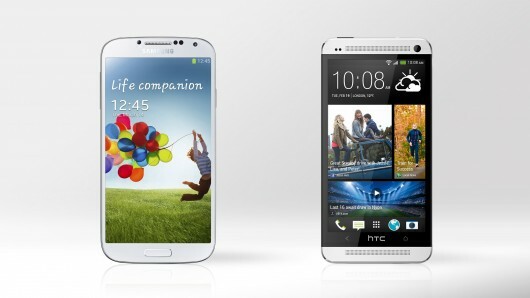 Unfortunately for HTC, though, all of the marketing momentum is moving in Samsung’s direction. The Galaxy S4 will likely outsell the One by leaps and bounds. Samsung knows how to throw all of its might behind marketing to maximize its devices' already-substantial appeal. ... but if you put that aside – and are only looking for the best Android phone of early 2013 – you have a tough choice in front of you.